Update (2:40 pm ET): With the event drawing to a close, Apple had 'one more thing' and...yeah, it was Oprah. The legendary TV host, billionaire entrepreneur, and rumored presidential candidate has two documentaries in the works for Apple right now...including one about anxiety and depression. A news/magazines subscription service called Apple News+ for $10 per month: looks impressive and well designed. Should do well given the promotion in the iPhone. The Apple Arcade gaming service was light on details, but appears to be going in a very different direction than Google Stadia. It should do well depending on the price, which wasn’t disclosed. Apple Card credit card: very impressive credit card functionality, high cash-back, and no annual fees will encourage iPhone users to get this card in large numbers. New Apple TV app: the new app itself is not a huge upgrade over the previous version but can integrate with Starz, HBO, and Showtime. The original content seemed impressive, but minimal. It was well presented. Unfortunate not to see a price on the service. Apple’s shares have ended the event near a session low, down 1.9 percent on the day. The S&P 500 Interactive Home Entertainment Industry index fell sharply as Apple spoke about its Arcade feature, though paired some declines as the subject moved on. Video channel peers Amazon and Netflix rose as Apple outlined its vision. Update (2:20 pm ET): Apple shares have slid to their lows of the session as Tm Cook parades a gang of celebrities on stage - including Steven Spielberg, JJ Abrams, Reese Witherspoon, Hailee Steinfeld and others - to explain the 'Netflix Killer' aspect of Apple's new "Apple TV Channels" product, which will include original content, as well as allowing users to pipe in content from cable and other streaming services. On Twitter wit wondered aloud how much the the company spent on all of these celebrities, a question that Apple shareholders were probably also asking themselves. After walking on stage much to the audience's surprise, Spielberg was greeted with uproarious applause. In a hilarious twist considering the number of reporters in the audience, Apple revealed that one of its new 'original' programs is a Sesame Street spinoff intended to teach youngsters how to code...the journos were, unsurprisingly, less than thrilled. In other equity news, gaming stocks (EA, Gamestop) have fallen on the revelation of Apple's subscription gaming service, while Visa shares sank as Apple revealed it would partner with Mastercard for its credit card service. Update (1:50 pm ET): Apple shares remain lower on the day as the company has largely hewed to expectations with its product launch, officially unveiling its Apple-Pay linked Mastercard (customers can apply and be approved within minutes), it's Apple News+ magazine subscription and Apple Arcade, its subscription gaming service - an area where Apple is hoping to lead, offering access to 100+ exclusive games. In addition to the card, Apple will offer personal loans and mortgages, beginning next year (we hear those are very popular with the millennials who buy Apple's products). It also unveiled its new Apple TV service - called Apple TV Channels - which will include content from Amazon Prime and other individual streaming services like HBO Go or Starz, while watching shows or sport, all within Apple’s TV app. That will be available starting in May. We're still waiting for more information about the company's streaming services. 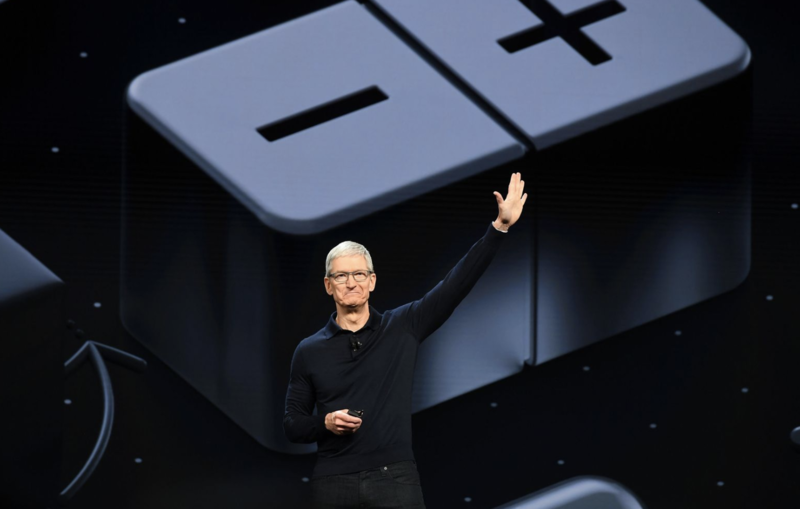 If Apple CEO Tim Cook was hoping to dominate the media spotlight on Monday for an Apple launch event that's expected to be nothing short of revolutionary, the he couldn't have picked a worse day: The release of AG Barr's summary of the Mueller report, as well as the ongoing Brexit drama, will vie for investors' attention - along with the beginning of another round of trade talks in Beijing (though we likely won't see any substantive leaks until later in the week). Nevertheless, prominent Apple analyst Dan Ives, and many others, are saying that Monday's event could mark an inflection point for the company, as Cook is expected to finally unveil new services packages that could rival Amazon Prime and Netflix, marking Apple's heralded transition from a consumer tech into a bona fide services company. Partly out of necessity, as sales of Apple's all-important iPhone, along with other products, have stagnated, Cook has been touting Apple's climbing services revenue during interviews and earnings calls. Though details are still sketchy, Apple is expected to unveil a subscription news service (powered by the Wall Street Journal and Vox), a streaming video service, a subscription video game service, and its new credit-card business (a joint venture with America's favorite consumer bank, Goldman Sachs. The card will help users focus on 'financial wellness'). According to the Wall Street Journal, some Apple employees are calling the potential Apple TV streaming app a "Netflix Killer." Apple has already discussed offering discounts to users who subscribe to multiple services, and, according to Bloomberg, it might even launch a prime-like bundle combining all of its new offerings. The result could be a 'revolutionary shift', Ives said. "This is a pivotal shift for Apple and in our opinion the biggest strategic move since the iPhone was unveiled in 2007," said Dan Ives, an analyst at Wedbush Securities. "There is massive pressure on Cook and Apple to deliver on services, with streaming content a potential linchpin of growth." 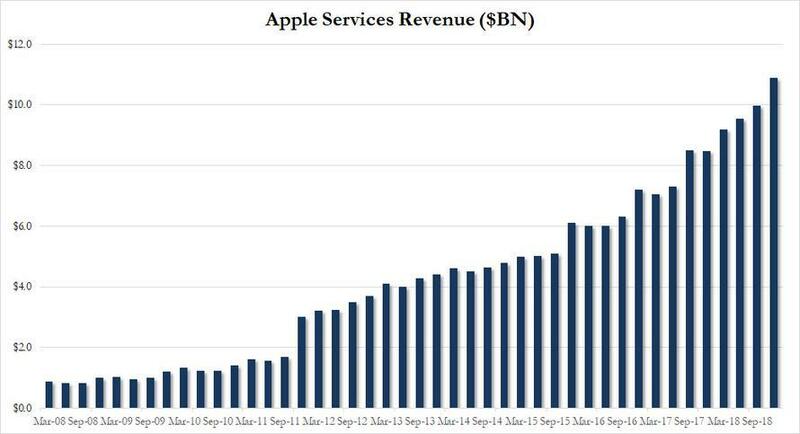 Given Apple's base of 1.2 billion active devices, Ives believes the services could expand to 100 million subscribers within the next five years. This could translate into up to $10 billion in annual revenue. 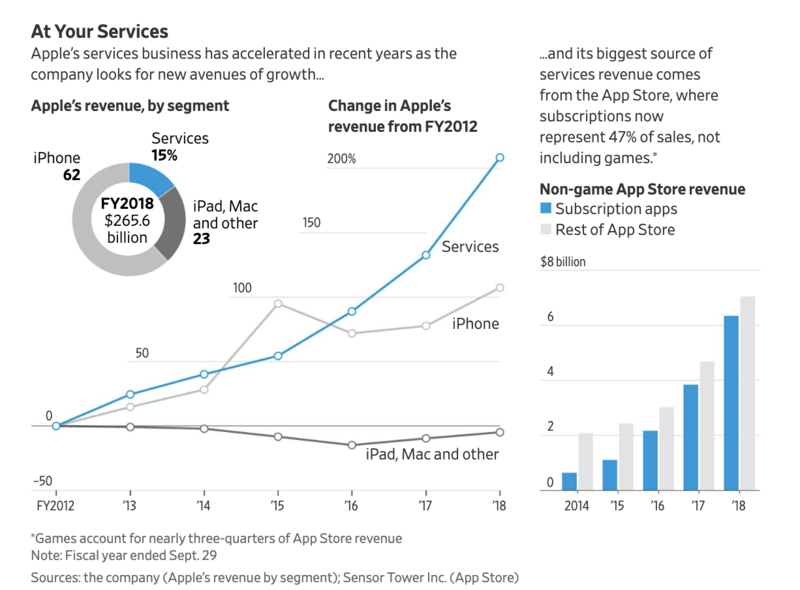 "If Apple executes with minimal speed bumps and aggressively acquires content, given the company’s massive installed base and unmatched brand loyalty we believe reaching 100 million subscriptions in the medium term (3 to 5 years) is a realistic goal that could translate into a $7 billion to $10 billion annual revenue stream over time," Ives wrote in a recent note to investors. The service will focus on original content, including TV shows and movies from producers such as Damien Chazelle, M. Night Shyamalan, and Oprah. There are documentaries, such as "Elephant Queen," and animations, like “Wolfwalkers” by Oscar-nominated studio Cartoon Saloon, along with a re-imagining of the “Amazing Stories” from Steven Spielberg, and a drama starring Jennifer Aniston and Reese Witherspoon. An important, unanswered question: Will the company keep its streaming creations exclusive to Apple devices, or release them on Android phones and other distribution channels? Apple’s original content will begin rolling out toward the end of the year. A major component will be a feature for tapping into bundles of content from providers like HBO, Starz, and Showtime -- similar to Amazon’s Channels offering. Netflix and Hulu won’t be involved. This service will combine stories from newspapers, websites, and magazines into a new tab in the Apple News app on iPhones, iPads, and Macs. Apple plans to charge about $10 a month. The service will come as part of an upcoming iOS 12.2 software update, which will also include a redesigned icon and interface for the Apple News app. The New York Times and The Washington Post are not part of the service, but The Wall Street Journal and Vox will participate. Apple based the service on Texture, an app it acquired last year. Texture lets users subscribe to more than 200 magazines, and most of those will transfer to Apple’s new service. (Bloomberg Businessweek and Bloomberg Markets are currently part of Texture). Apple and Goldman Sachs Group Inc. are working on a joint credit card tied to the iPhone and Apple Pay app. Goldman CEO David Solomon is planning to attend Monday’s event, suggesting the partnership will either be announced or a deal is near. Apple’s iOS 12.2 update will include a new Wallet app that lays the groundwork for the Goldman credit card. The card will support a new virtual rewards and tracking system to encourage timely payments. The event, Apple's third to be held at the Steve Jobs Theater in Cupertino since the venue opened two years ago, is expected to begin at 10 am PT (1 pm ET). Interested parties can watch it live on the company's livestream here.